Do you want to offer a special price for your services on special days like holidays or on weekdays? If yes, then you can easily setup such special prices for your services using our Booking & Appointment Plugin for WooCommerce. We have Special Price setting in our plugin which allows you to setup your services with a special price on weekdays and also on any specific dates. 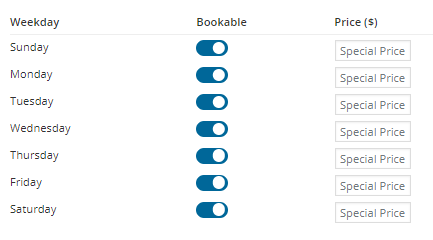 No matter if your service is bookable for Single Day or Multiple Nights, you can use this setting with all type of bookings. Suppose the customer selects a day on which you have set special price, then the price which is set for that day/date will be applicable instead of the Regular/Sale price. Resorts, hotels, amusement parks etc., are good example of the businesses in which they offer a special price for weekends or any special occasions. In this post, we will see how to setup services with a special price on weekdays or holidays with our Booking & Appointment Plugin for WooCommerce. For instance, you have a hotel/resort business and you want your customer should be charged a special price on all weekends or on particular dates for booking a stay. 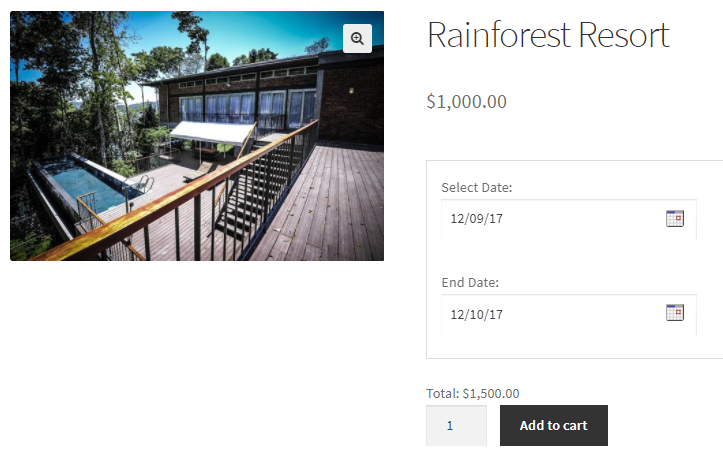 Then you need to setup bookings for your resort first, for which create a product Rainforest Resort from Products->Add Products link. 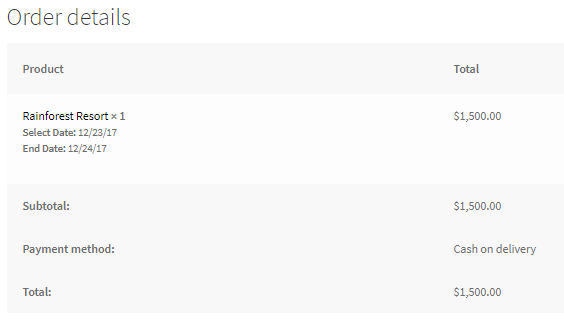 On the same page, there is Product Data meta box where you can set a regular price of your service in Regular price($) option as shown in below image. For this instance, let us set it to $1000. Now, let’s see how to setup special price on weekdays or holidays. All options to set special price for any weekdays/dates are located in the Availability tab where you will find the Bookable Weekday table as shown below. All weekdays are selected here by default, so you need to make the selection as per the requirement. We have selected all Weekdays for booking the resort at a special price of $1500 only on Saturdays and Sundays. 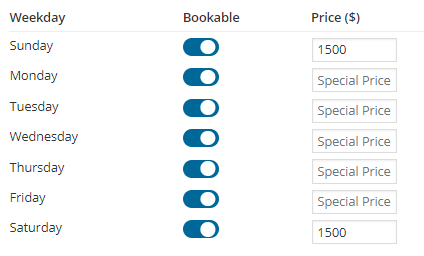 Similarly, you can also add a specific date for giving special price which can be set from the Set Availability by Dates/Months option by clicking on the Add New Range button. 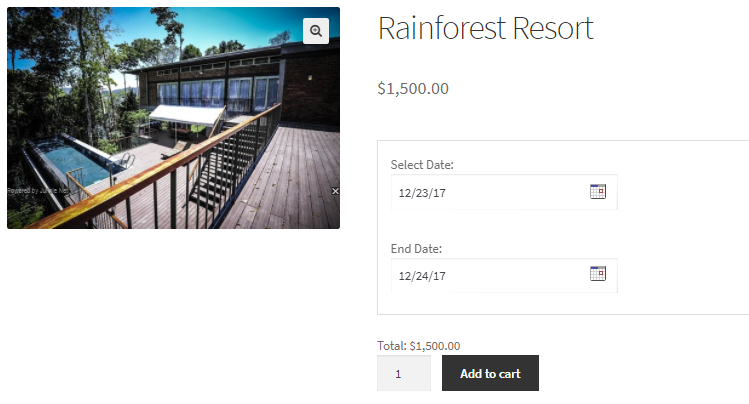 After finishing these steps, your Rainforest Resort product is ready to be booked with a special price on weekends and specific dates. 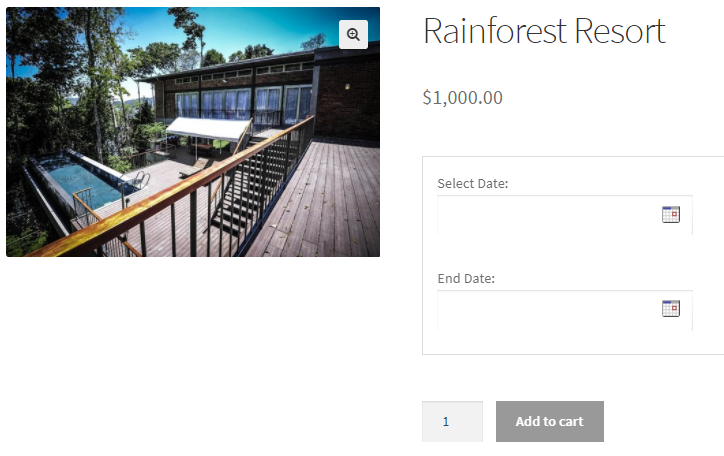 This is how your Rainforest Resort product will look on the front end when the customer visits your store to book it. 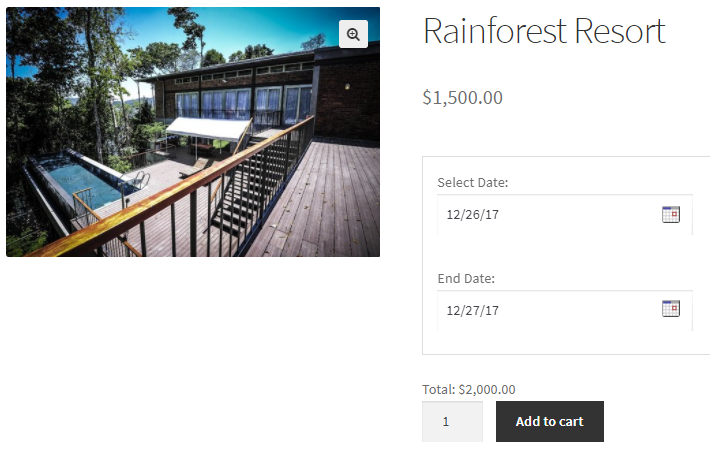 Here you can select the day for booking the resort from the booking calendar where all Saturdays and Sundays will show a special price of $1500 and added specific dates – 13th December and 25th December, 2017 will show special price of $2000. 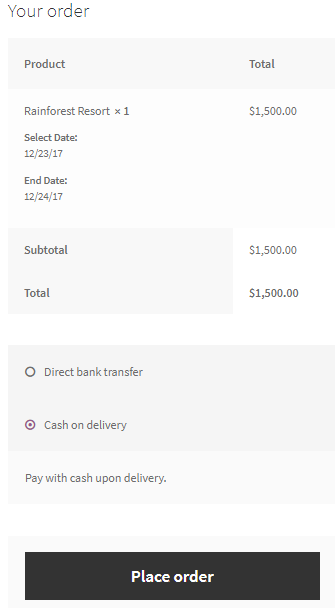 Similarly, if the customer selects from any specific dates, say for instance 26th December, 2017 as selected below, then the special price of $2000 will be applicable. In this post we saw how to set special pricing for any weekdays or specific dates. The instance was taken of Multiple Night booking but we can also setup the same with Single Day booking with our Booking & Appointment Plugin for WooCommerce. Some of the examples where Special Price feature can be applicable for single day bookings are an amusement park, one day tour, drama tickets etc. Special Price settings helps to attract customers to book the service as it provides competitive pricing for weekdays or specific dates compared to actual pricing. The special price can be a discounted price than the product regular price or it can be more than the product regular price, depending on the business requirement. 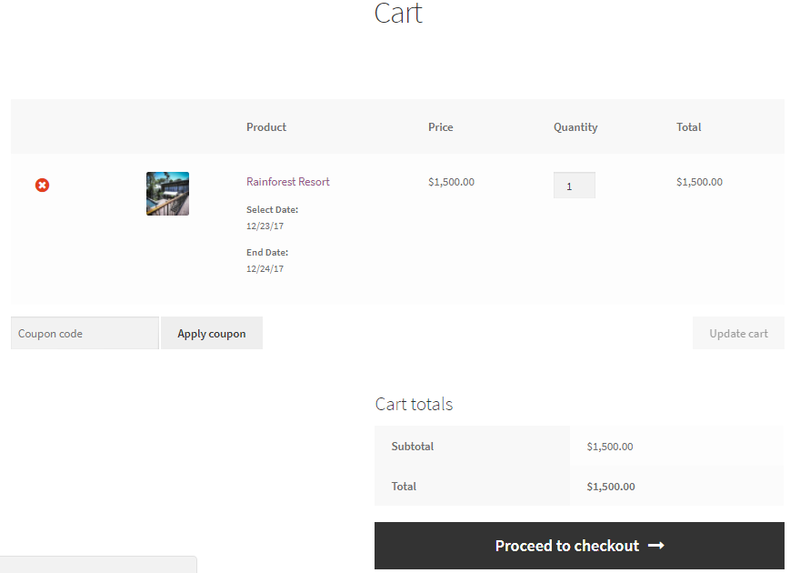 The above instance was for WooCommerce Simple product, you can also use this setup for WooCommerce Variable product. The setup can take around 15 minutes to complete if you are setting it for the first time.